Our lightest mat in standard length. Great for travel or for those who like closer contact with the ground. Available in a variety of colours. 1.6kg; 173cm long x 61cm wide x 3mm thick. We use natural rubber because it grips better and has more cushion than any of the synthetic rubbers on the market (PVC, PER, TPE, EVA). It is also better for the earth as it is made sustainably. Jade mats contain no PVCs, heavy metals or ozone depleting substances. All components are approved by FDA for use in rubber in continuous content with food. Although Jade mats are 99% latex free, as they from a rubber tree, there may be trace amounts of latex proteins in the mats so we recommend persons with latex allergies avoid contact with our mats. Jade mats are eco-friendly as they are made with a renewable, sustainable resource - natural rubber, tapped from rubber trees. Jade mats contain no PVC or other synthetic rubbers. Jade mats are made in the United States in compliance with all US environmental, labour and consumer safety laws. How do I clean my yoga mat? As Jade yoga mats act like sponges - and hold water, we recommend simple wiping the surface of your mat on a regular basis with plain water. If your mat needs an occasional deep cleaning, that is fine, but you should be aware that as Jade mats act like sponges, holding soap and water, you must be prepared to thoroughly rinse and dry your mat. You can wash your mats by soaking in a bathtub, hosing it off or in a front loading washing machine (no agitator) on gentle. We recommend a mild soap. Do not use oils, solvents or harsh abrasives. The yoga mat should then be hung or laid flat to dry. DO NOT DRY IN OR ALLOW PROLONGED EXPOSURE TO DIRECT SUNLIGHT. While it has always been our goal to make the best performing yoga mat on the market and we are very proud that Harmony is made with natural rubber, a renewable resource, contains no PVC or ozone depleting substances and is made in the United States in compliance with US environmental laws -- we felt we could and should do even more. We looked for a partner to help us give back to the earth and found Trees for the Future to be the right choice. Through this partnership with Trees for the Future, we plant a tree for every yoga mat we sell. We are dedicated to ensuring the highest possible quality service to our customers. You can send us a message by using the "Questions and answers" section towards the bottom of the page. The item "Jade Yoga 68 Travel Eco Friendly Yoga Pilates Exercise Fitness Mat Standard 3mm" is in sale since Monday, May 09, 2016. This item is in the category "Sporting Goods\Fitness, Running & Yoga\Yoga & Pilates Equipment\Mats & Non-Slip Towels". 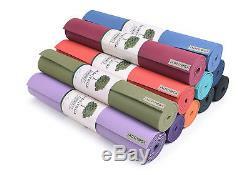 The seller is "yogastudiouk" and is located in Dorset.